"It's a great time to be Cisco." 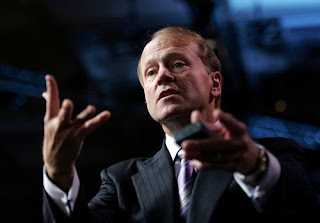 That line came from John Chambers, CEO of Cisco. Despite declining sales, Chambers told CNBC that his company had no plans for layoffs, but rather, had moved $500 million into a fund to pursue new growth opportunities. The same day that I saw Chambers interviewed, I interviewed the CEO of a billion-dollar company who had just announced layoffs. However, unlike Chambers’ Cisco, this CEO’s company was booming, with sales up nearly 20%. So why the layoffs? Because they’d projected an increase of sales of more than 25%, so 20% was a disappointment. Talking to the CEO, I believe that layoffs actually cost MORE than letting the company grow into the larger staff, but the CEO felt the need to react and layoffs have become the knee-jerk reaction of executives everywhere. [Speaking to all employees] As you know, our sales revenues are down. I know that you must be worried – fear is a rational response when the media are full of images from the Great Depression. Indeed, everyone is expecting me to announce layoffs – stockholders and other investors want me to do something – anything -- to help keep profits from declining, and layoffs are tangible evidence that a CEO is responding. However, I am announcing today that we will NOT be having layoffs anytime soon. When companies proclaim that they are going to cut staff, here’s what usually happens. Some of those “cuts” are merely positions that were put in the budget and have yet to be filled, so eliminating them doesn’t actually reduce current spending, just future budgets. Next, and more importantly, the cuts tend to be among the least expensive employees, especially entry-level employees. Thus, should you succeed in reducing the headcount by 10%, you’ve actually cut the spending on personnel by less than 5%, perhaps only two or three percent. Further, total spending on salaries is just a fraction of overall costs; in our case, one-quarter of total expenses. So if you announce a ten percent lay-off, you reduce one-quarter of expenses by a few percentage points, meaning that you succeeded in cutting costs by one or two percent. And what is the cost of that cost savings? You have fearful employees, hunkering down, devoting much of the internal conversation organization to worry. That’s not what we hired you to think about. So today, instead of announcing staff cuts, I am asking you to do join with me in doing the cutting – cutting waste out of our system. My goal is that we find ways to reduce costs by 10%. This will have a financial impact five times greater than cutting the staff by 10%. Further, I want you to find new efficiencies that allow us to take out expenses while better serving our customers. In other words, I’m asking you to be creative, and for that I need confident, bold employees. If we do this right, and do this together, we will become a better, faster organization. Together we can go without layoffs. Instead of worrying about who will stay and go, I invite you to join me in worrying about how we will become even more useful to each other and to our customers. Instead of getting rid of some of you, I’m counting on all of you – now go out and prove me right. I loved your comments and wish there were more CEO's who worked to inspire their employees. It's sad that most don't tap into the talent and creativity of the employees they have hired - they might very surprised at how much they could achieve if they did!